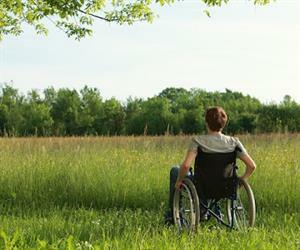 Young patients often feel isolated during the rehabilitation journey. The installation of a custom made sit-stand desk at a new brain injury rehabilitation centre in Melbourne's south-east has sped up patients' recovery process. The brand new, advanced centre has enabled patients to move out of hospital or nursing facilities sooner, where specialised care can begin. As a result, the rehabilitation process can also start sooner. Moving patients out of hospital and into proactive rehabilitation kick-starts not only the physical journey, but the emotional one too. A dedicated centre allows for more specialised, expert care. Brilliant care at the centre involves extensive physical, behavioural, cognitive and emotional patient assessment. Individualised programs, advice, exercises and assistance assures the most productive care. Height-adjustable desk specialist Ergomotion installed a custom made standing desk at one of Australia's first brain rehabilitation hubs. The electric height adjustable desk was installed for the rehabilitation of patients. A few particular design modifications meant they could create a desk that could be adapted to the specific needs of patients at the centre. The electronic motors means users – even those in wheelchairs – would not struggle to operate the lifting and lowering desk mechanism. Rehabilitation exercises generally fall into two main areas: physical and cognitive. The most common cognitive activities involve skills like language, memory, reasoning and visual perception. These activities are designed to train (or retrain) the brain. Cognitive rehabilitation is commonly associated with the colloquial "brain training", but these two terms differ slightly. Brain training is normally used by healthy individuals who wish to "prevent age-related deficits before they occur" – like Lumosity or Nintendo brain training apps and games. Cognitive remediation or rehabilitation are exercises designed to improve cognitive deficits. Physical rehabilitation exercises will differ in not only the area of the body being worked, but also the intensity of the activity. Every patient will be at a different stage of their individualised rehabilitation routine, so it's essential they are armed with the tools and equipment to cater to their individual needs. When it comes to sit-stand desk, the ability to adjust its height to suit each and every user in facility ensures maximum benefit and use. Height adjustable desks: why is electric better than manual? It's just like the age-old automatic vs manual car debate. It's simple: manual means worked by the hands rather than by an electrical device. Hand-cranked height adjustable desks often become cumbersome. It's not unusual for those kinds of desks to end up as stagnant, sitting desks. Furthermore, it's not unlikely that patients will need help from a carer to adjust manual desks, rather than having the freedom to do it themselves, when they want to, with just the push of a button on an electric height adjustable desk. Ergomotion crafted the desks to have a deep cut out on the front surface, much like a semi-circle cutting into the desk. The custom made desks allow those who use wheelchairs to move closer to the desk to do their rehabilitation exercises. 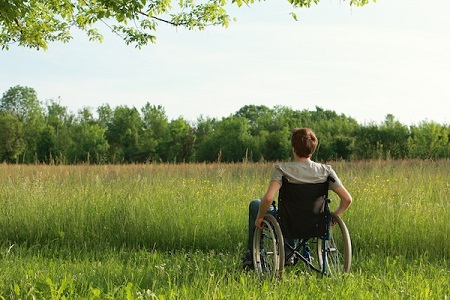 All patients are in different circumstances and therefore have different needs – some are wheelchair-bound, whereas others are standing. The key here is adaptability, and the ease with which the furniture and equipment supporting their rehabilitation journey can adapt to their needs, and provide them with the most effective and comfortable setting. Doing a quick Google search on young people living in nursing homes will reveal it to be a sensitive debate topic. The facilities common in nursing homes are often not suited to younger patients who will frequently find themselves improvising exercises on equipment not quite right for them. In the past for Victorian patients there have been very few alternatives. The new Melbourne rehabilitation centre provides an opportunity for young people to begin a more proactive and appropriate recovery journey. Youngcare is an Australian organisation dedicated to raising awareness and funds to move young Australians out of nursing homes and into more appropriate rehabilitation centres. They've released some statistics on their website that help illustrate the issues young Australians face when they have little to no choice when moved to an aged care facility for their recovery. Social isolation and depression are some of the links associated with young people in aged care. Moreover, the issue here does not lie solely with the individual. Family and friends who surround them also feel the strain, stress and a sobering feeling of helplessness. This new centre will provide some much-needed and specialised care for younger people who have a growing need for specialised, dedicated, advanced care. Slick design and equipment, paired with brilliant nursing and neurological specialists, will help create a proactive and positive environment for these patients on their way to recovery.